MPG has offered not 1 but 3 lucky winners their choice of top, bottom, jacket and tote! That's right! 4 products each to all 3 winners! This prize is available for both MALES and FEMALES ! Prizes are also open to USA/CAN!!! a Rafflecopter giveaway Disclaimer: MPM was compensated for this giveaway. ALL other participating bloggers DID NOT receive any compensation for this giveaway. MPG is the ONLY one responsible for the prizes. Facebook, twitter, pinterest etc is NOT responsible or liable in ANYWAY for this giveaway! If you want to work with Mom Powered Media (MPM) or have any questions please message Natasha at natasha@mompoweredmedia.com ! Good luck guys! Even though my "babies" aren't so tiny anymore, I still need to keep my eye on them constantly. Having both a 3 year old and a 4 year old means there is always some sort of mischief going on. Sometimes it involves "painting" the walls with their peanut butter and jelly sandwiches, and other times, it means trying to dress a sleeping kitten in doll clothing. (Which the cats really don't appreciate!) Yep, I have double-trouble going on here, and sometimes I truly believe I need an extra set of eyes located on the back of my head. You know...So I can be all-seeing and all-knowing, just like the kids think I am! Luckily, I recently discovered the extra set of eyes I've been needing! 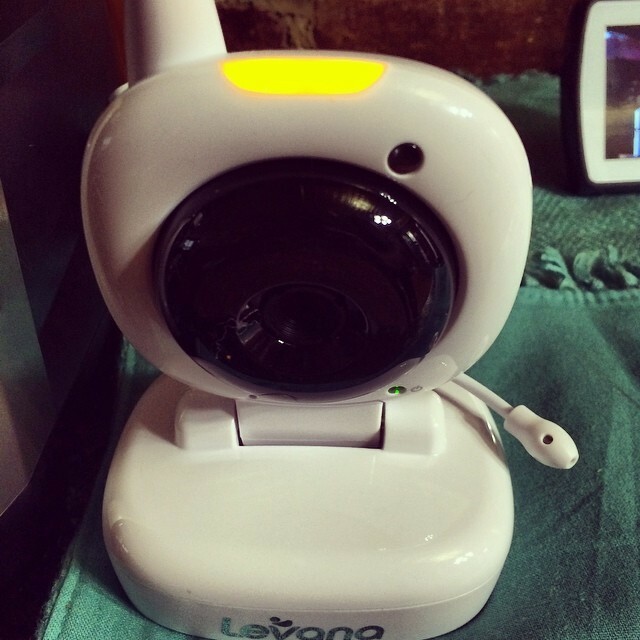 We received the Levana Ayden Video Baby Monitor as a part of the "Do More Knowing Your Child Is Safe" campaign. Now I have to admit, while I have tested out several baby monitors over the past 4 years, I had never heard of this brand. Of course, that made me all the more eager to see what Levana has to offer! When our monitor arrived, I was a bit confused. I actually thought the instruction manual was missing! Upon further investigation, I realized that the folks at Levana like to keep things simple by creating truly user-friendly products. There were instructions, they were just condensed into 3 short pages. Compared to the super-thick, confusing booklets I am used to using, this was a refreshing change to say the least! The Ayden offers anything a busy mom could ever need. It's got a generously sized 3.5" screen, and you can switch between crystal clear color images and night vision. The night vision definitely comes in handy, and saves me a million trips at night to check and see if the kids are breathing. Yes, I still do this. Don't judge. If your little ones are afraid of the dark, this monitor comes equipped with a built-in night light, too! In addition to these viewing options, there is also a temperature display so you can always be sure that baby is comfortable. If they wake up and need a little soothing, there are also 3 pre-set lullabies that you can have played with the simple push of a button. Another feature I am definitely loving is the Talk to Baby 2-way communication. This allows you to hear every giggle, sigh and whimper AND talk back to your child through the parent unit! How cool is that?! Of course in MY house, it's usually used to tell my little ones to stop acting out. But hey. They're 3 and 4. I suppose that's to be expected at their age! But the thing I love the most about the Ayden Video Monitor would have to be its range. This system is completely digital, which eliminates the risk of cord-strangulation, which is a HUGE plus. Also, thanks to Levana's ClearVu® technology, your digital signal is completely private, viewable to ONLY you, and remains interference-free up to 750 ft. away. This means I am able to go out to the yard and leave my little ones inside with their teenage brother, but I still have peace of mind since I can take a peek and see what they're up to, as well as hear any chaos that may be unfolding. Pretty darn nifty, if I do say so myself! 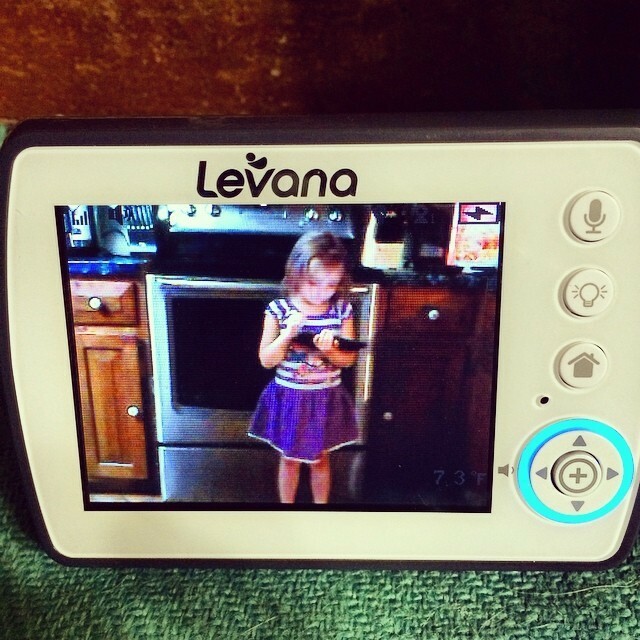 Overall, I am definitely very impressed with the Levana Ayden Video Monitor. This little gem is so easy to use, and offers all of the convenience features modern parents look for. And at a price of only $119.99, it won't break the bank. Have more than one child in need of supervision? No worries! This monitor can be expanded for use with up to 4 separate cameras, which can be set on top of a dresser or even mounted to the wall. Yes, these folks really have thought of everything! So if you're a new parent or an old pro like me, I would definitely recommend checking out the Levana Ayden Video Baby Monitor. It has superior picture and sound quality, an amazing range, and even incredible battery life. This is truly a wonderful product, and can help YOU do more knowing your child is safe. Would you like to win a Levana Ayden Monitor of your own? 3 lucky folks will have the chance to do just that! This giveaway is open to US residents and will end on August 6, 2014. Please enter on the Rafflecopter form below. Good luck! Mom Powered Media wants to show you how much education means to us and the future of our wee ones and are personally sponsoring a Target and American Eagle Gift Card! Aloetree is a brand new organic children’s clothing line with a mission to give back to kids and raise funds to prevent child trafficking. This clothing line is not only gorgeous and perfect for any little one in your life but it has special characters that tell a special story of a different eco-system and unique and positive quality. I am not pregnant now, but I DID spend almost 2 straight years of my life expecting, since Sophie and Xander are only 12 months apart in age. This made celebrating birthdays, Holidays, and going to special events a bit of a challenge. I didn't have anything cute to wear that fit my growing shape. And let's face it: When you have back to back pregnancies, chances are, you don't feel very glamorous, anyway. Comfort is more of a priority than looking polished and well put-together. Unless, of course, you're Kim Kardashian. But that's a whole different post entirely. Their apparel ranges from casual tops and dresses to more elegant looks perfect for the office or even a special occasion. Rich colors, luxurious, eco-friendly fabrics....This is the fashion we crave when we're not expecting, so why not enjoy it then, too! The best part? Many of these pieces are designed to be worn both during and after pregnancy. How cool is that?! Here is a little about the National Geographic Kids Look and Learn series, they were designed to bring fun, lively content to the preschool set with board books that cover a range of topics in an engaging, interactive way. Each book in the series focuses on a different concept or subject and is designed specifically to cultivate early concept learning with context reinforcement so learning sticks. Whether it's parts of the body, counting, baby animals, colors or exploring the world of same and different, each durable and sturdy board book is filled with bright, gorgeous photographs and is developed in conjunction with experts in the field of child development and growth. Perfect for developmental skill building for ages one to four, these eye-catching books make early learning fun! One LUCKY winner will receive a Look and Learn Prize Pack comprised of Colors!, Counts!, Baby Animals, Match!, Same and Different and All About Me Books(ARV: $42.00). Giveaway will end August 5th at 11:59 pm PST. This giveaway is in no way affiliated with Facebook or Twitter. Winner will be notified within 48 hours of the giveaway end. Winner will have 48 hours to respond or a new prize winner will be chosen. Participating Bloggers are not responsible for prize fulfillment. This giveaway is no way associated with or endorced by Facebook, Twitter, Google+, Pinterest or Instragram. We have teamed up with some great bloggers to tell you about Medu Jewelry, and offer one lucky reader the opportunity to win this beautiful faceted onyx necklace, valued at $79! This beautiful accessory would add a great finish to your outfit of choice. Wear it with your favorite LBD for a fun evening out, or put it on with a white shirt and black leggings for a casual lunch with the girls. Onyx is a member of the quartz family, and more specifically of the chalcedony group. This is a type of fibrous quartz that displays bands of color within a gemstone. Even more specifically, onyx is a variety of agate, which displays fibrous bands in white and black, sometimes with gray, although most often the stone is dyed so that it appears pure black. While black onyx is the most famous, there is also Sardonyx, which features slim red bands running through the black stone. The name onyx comes from the Ancient Greek word for fingernail. When choosing a quality onyx stone, be sure to look for an absence of pits, nicks and a well-polished appearance. Onyx typically appears as either a translucent or opaque gemstone. Most often jewelry is made out of real onyx, whereas carving and other items may be made out of a synthetic onyx that has been found coming from Pakistan and Mexico. Onyx is typically used to make beads, and sometimes appears in cameos. Onyx is mined in Canada, the United States, Brazil, Madagascar, Uruguay and Scotland and has excellent toughness and wearability. This necklace has 10mm onyx beads and a beautiful .925 silver clasp. Disclaimer: This blog and any participating blogs did not receive compensation for the published material in this post. No blog participating in this giveaway is financially affiliated with any of the companies mentioned. You do not have to make a purchase to enter this giveaway and there is a limit of one entrant per household. Void where prohibited. Odds of winning are determined by the number of valid entries received. Winner will be chosen by Random.org and will be emailed via the email address used to enter the contest. New winner(s) will be chosen if original winner(s) has not responded within 48 hours of email notification. This blog and other participating bloggers are not responsible for shipment of prize(s). Sponsor(s) are responsible for all shipping costs related to prize(s). This giveaway is not administered, sponsored, endorsed by, or associated with Facebook, Twitter, Google, Pinterest or other social media outlet. Disclaimer is posted in accordance with the Federal Trade Commission 10 CFR, Part 255 Guides Concerning the Use of Endorsements and Testimonials in Advertising. Are your kids picky eaters? I know mine sure can be at times! Thankfully, they seem to love eating healthy, often organic foods. Sophie and Xander love snacking on fresh fruits and veggies, especially if I offer some creamy dips or hummus to go along with them. Of course while they do love their fruits and veggies, sometimes they're stubborn and only want to eat one or two specific things for a week or so at a time. (This week, it's chicken nuggets and fruit.) When they go through these phases, foods they usually love become their worst enemy. They ONLY want what they want, and refuse to eat anything else, or put up one heck of a fight about it. Thank goodness I recently discovered Vemma NEXT which contains an enhanced full spectrum of vitamins, antioxidants and over 65 plant-sourced minerals. Just 2 ounces of this delicious kid-approved beverage gives super-charged immune protection, critical brain development nutrients and specific ingredients designed for children’s growing bodies.